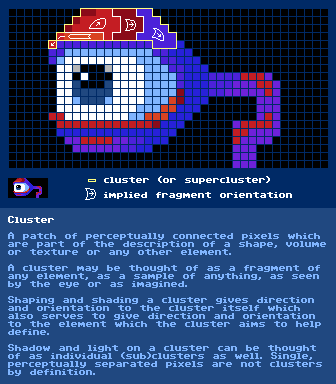 update Nov. 17th 2018: Porting (plus some additions and edits) this glossary is finished. update Nov. 9th 2018: I have starting porting this glossary to a proper wiki at http://paag.dennisbusch.de which will make maintenance and expansion much easier. So the glossary in the first post of this thread will not be updated anymore. I will still watch this thread for suggestions on terms that should be included in the glossary. This is NOT an attempt to create and provide a formal definition of "Pixel Art" nor an attempt at providing a ruleset on good and bad practices. It is to be understood as being purely descriptive. I shall also attempt to keep the final document descriptive and not judgemental, so e.g. something like "Pillow Shading" will be included but there will be nothing in the description which advises for or against doing it (should be self evident to the readers to make the "right" decision from seeing a pillow shaded image without rubbing it in their face). Most entries already have at least a brief summary and/or links to vast amounts of information on everyones favorite open encyclopedia. Readers of this thread are encouraged to throw in Terms which should be included in the Glossary. Literally a color "without color", which is all shades of gray and black and white. Practically all colors without a strong perceptual chromaticity are called achromatic. which refers to the distinctly visible changes between stripes of colors hugging each other in what was supposed to look like a soft gradient. The thin fringe (drawn or perceived) between everything that is part of an object and everything that is not part of that object. A difference between any two things. Hues can contrast (see complementary colors). Values can contrast. Shapes can contrast (e.g. round shapes contrast pointy shapes). Lines can contrast (horizontals contrast verticals, wavy lines contrast straights). Pretty much any thing has the potential to create a strong perceptual difference between itself and something else. 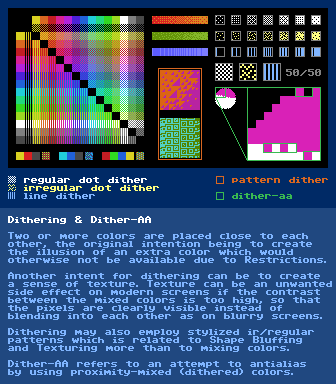 Is done by changing the components of a color in a digital color model (such as RGB) or by placing differently colored pixels close to each other (mixing by proximity, called Dithering). For pixel art, make sure to use any "lossless compression" format. PNG is a good one. 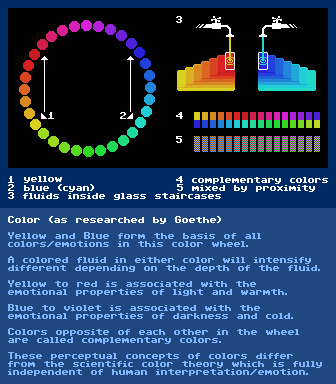 A Color Shift in which the Hue property of the initial color is shifted to another Hue. Often (arbitrarily) used to render the light and dark parts of shaded volumes with a different Hue in addition to a different Lightness. There are observable phenomena in nature which show shifts in Hue (see also Color) under some lighting conditions. 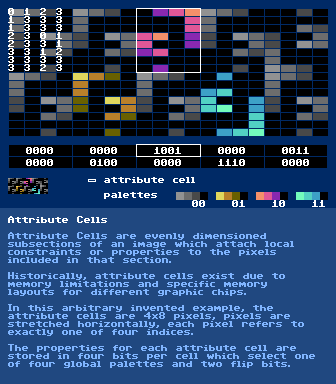 An image saved with a limited amount of colors, each color refered to in the raster as the index number at which it occurs in the palette, see also palette. 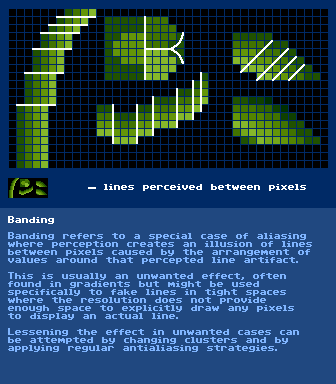 Creating Pixel Art in Indexed Modes, working with Indexed Images while paying attention to Palette Structure and keeping possible Palette Effects in mind and at all times keeping control over (if necessary by fixing the results) the pixel level polish of a piece even when using tools that influence more than one pixel at a time. 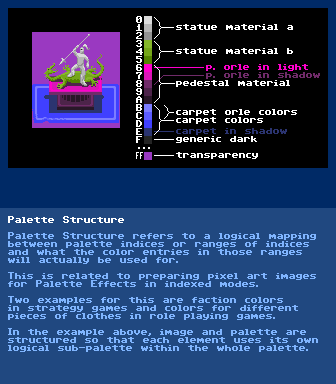 Historically, "Index Painting" is the natural way to go and think about making Pixel Art as most hardware and digital image editing tools either used Indexed Modes as the default mode or simply did not provide any other modes. The term "Index Painting" was not around then because there simply was nothing else. 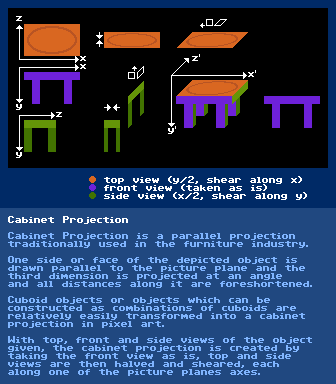 Today the term seems to be used to set "Pixel Art"(in the sense of Index Painting) apart from other "Pixel Art"(in the sense of Digital Painting and Computer Generated Imagery(e.g. 3D renderings)) and the third kind of "Pixel Art"(the purists "one pixel at a time"- process). 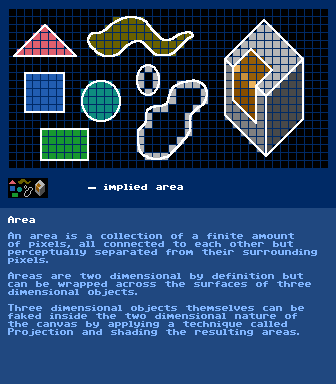 Some advocate placing one pixel at a time as the only "allowed" process to create "Pixel Art"(a term which eludes definition itself) while others advocate whether something is or is not "Pixel Art" can not be defined by processes but only by looking at the results. This lossy digital image format is unsuitable to store pixel art because of compression artifacts. All tints, tones and shades of equal hue. Visual swooshy action hints or the perceived blur along the path of movement of an object when your camera or eyes can not sample it fast enough to get a crisp image. All space that does not contain anything of the currently observed object. 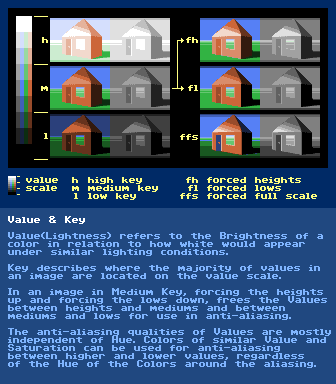 In Indexed Images/Modes where each pixel in the image refers to a specific color in a sequence of colors(=palette) (instead of holding the full definition of the color in each individual pixel itself), a number of visual effects such as Color Cycling and Color Fading can be achieved by manipulating the palette instead of manipulating the pixels themselves. 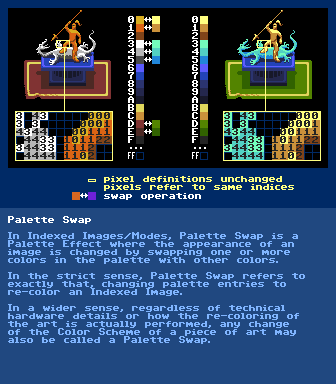 This was used a lot on old hardware as manipulating the definition of colors in the palette took much fewer CPU cycles than going through the image and changing the actual pixels themselves. 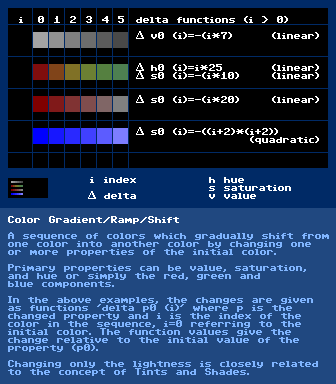 If a thousand pixels in an image referred to color at index five in the palette and index five would hold Green and index twelve would hold Red, all thousand pixels could be changed to Red by changing the color at index five from Green to Red instead of going through the image and looking for every Green pixel and changing the pixel itself to refer to index twelve. 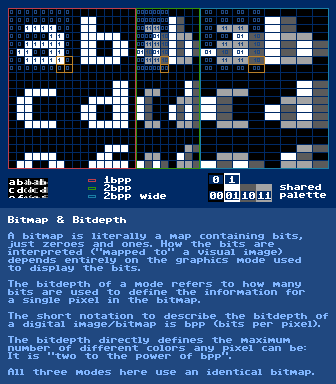 Painting with pixels means to apply blobs/clusters of colored pixels to the raster while thinking like a painter would think with traditional brushes and paint. The difference in (strict) Pixel Art is that the newly placed pixels do not blend or mix in any way with the pixels which are already there on the raster but instead fully replace them (unlike paint which mixes with the paint already on the canvas). Most Pixel Art editing software still has a multitude of painting or brush modes and layer effects though which can still cause a placed blob of pixels to blend/mix with the pixels that are already there. 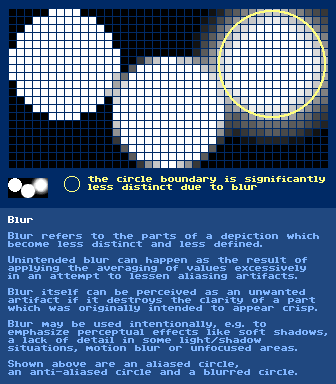 Restrictions are arbitrarily chosen or real (by hardware limits) limitations imposed upon a work of (pixel) art. The limitations include figures on resolution (horizontal and vertical dimensions of the piece in number of pixels), number of colors which apply globally to the whole image and sometimes additional local restrictions per Attribute Cell. 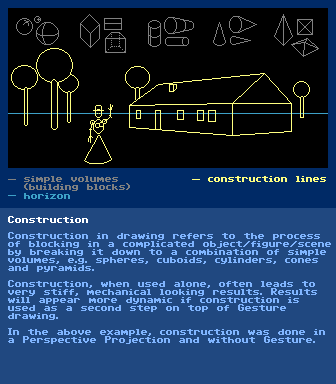 The process of applying value, color and texture to an imagined or wireframed structure in order to arrive at the final depiction of something. 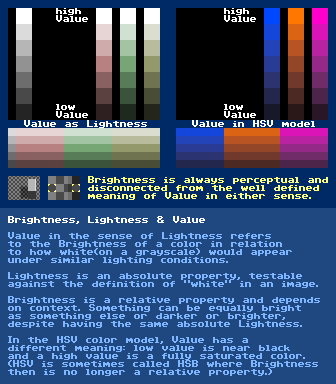 The perceived intensity of a specific color(hue). The process of applying different tints, tones and shades upon volumes in accordance with one or more real or imagined lightsources which illuminate those volumes. The goal of shading is to create an illusion of three-dimensionality on a two-dimensional surface(the canvas or raster). A shape is a two dimensional entity. Cutting through a volume with a plane reveals a shape along the cut (see also Cross Section). Shape Bluffing means to add abstract detail instead of rendering any specific texture onto a surface. Shapes themselves are two dimensional but the abstract detail added by "Shape"-Bluffing often appears to be three dimensional or aims to add a three-dimensional appearance to the surface/volume over which it is spread. A deliberately rough representation of anything, intended as a base for further work or just to capture a thought/idea or to explore different angles and details of a subject in preparation for a polished work or design. Synonymous with doodle. A usually limited set of specific ways to depict something, used consistently to achieve a unified look&feel across several elements of a larger collection of pieces. Pixel with an Aspect Ratio of 1:2 or any pixel which is taller than it is wide. 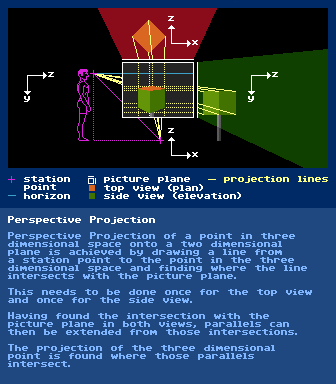 A three-dimensional body in a three dimensional cartesian coordinate system (e.g. sphere, cuboid, cone, cylinder, pyramid). To get a strong illusion of volumes on a two dimensional surface, it is desirable to employ a suitable projection in addition to shading the volumes consistently according to imagined lightsources and utilizing texture to emphasize surface curvature. A quick way to define Volumes first in sketches and in construction without having to fully render them. Also useful to draw the invisible sides of objects to find correct placement and proportion of things which are partially covered by other things. Pixel with an Aspect Ratio of 2:1 or any pixel that is wider than it is tall. The first dimension in a Cartesian Coordinate System. 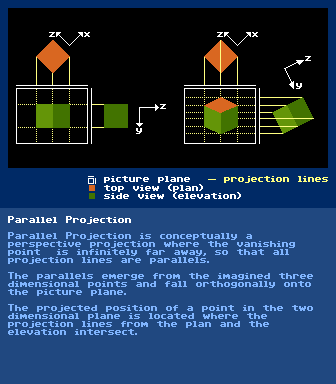 The second dimension in a Cartesian Coordinate System. 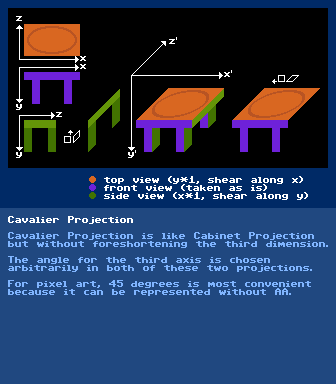 The third dimension in a Cartesian Coordinate System. I realise this falls under a sub category of correct lighting, but can we get a formal definition of the embossed/sticker effect that a lot of pixel art (and art in general) suffers from in some small way or another? 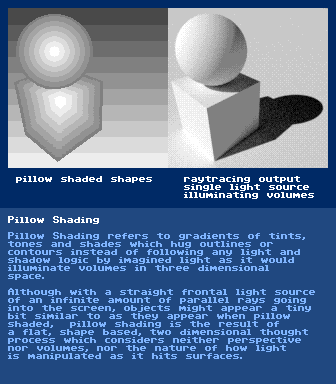 I'd group pillow shading in the same category, and Cure's tutorial addresses it, but no one seems to be formalising a mistake* a lot of skilled pixel artists even make sometimes. *I realise you don't want to say these are incorrect. I am simply implying they are unintentional. Sure something like that could be included somehow if we can think of a good descriptive term for the "issue". That way of shading does not seem incorrect per-se but rather a mismatch between a few things: the volume suggested by outline, the conditioned imagination of a viewers idea of a round belly volume, the way the belly was actually shaded with clusters hugging the outline which do not match the direction of light and do not support the definition of the volume due to that... ... it's a complex "problem", hard to formalize and put a term on. Closest I can think of from the top of my head is "Contextual Shape/Volume Perception Mismatch". That would be quite the monstrosity of a term though, so this might be something too specific to include in a Glossary and could perhaps better be handled in auxiliary texts or tutorials which may be free in themselves to be not purely descriptive and include suggestions for best practices while referring to terms from the Glossary in their descriptions of the hows and whys and reasons and context. 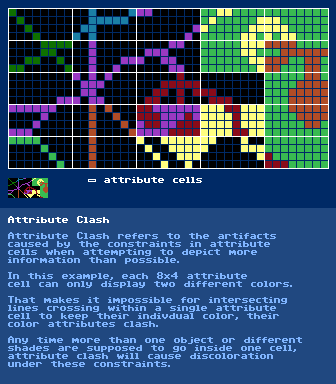 I just wanted to say, this is the kind of information which is well represented in the form of a wiki : This way, the glossary article is linked whenever the same word is mentioned in an other article. Wiki also helps linking articles -> categories -> other articles in same category. Yes, we could convert the first iteration of the "finished" document to a wiki and see where it goes from there (I personally would prefer a single page layout though with #anchor elements to link to individual terms for referring to them in discussion and as a good overview of all the things that we're dealing with in pixels and art.). Added your words to the opening post. Maybe you can take something from this. That is a good ref sheet. 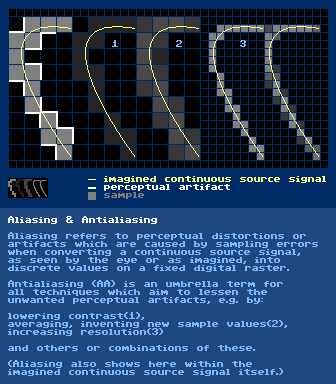 The math behind averaging samples to do AA is imo better left to be described in detail in an AA tutorial. The glossary description should be kept brief without going into detailing the "how" too much. Does anyone even do the math when applying AA? (I personally always go by feeling, constantly keeping an eye on the 1:1 view and also, strictly following the math does not always help to convey the intended direction of a curve... but yeah, I think that's all best to detail in an article/tutorial about AA strategies.). The AA qualities of Value independent of Color should probably be mentioned/hinted at in the entry for Value.